Uber and Ola had suspended surge pricing in Delhi after the Delhi government’s directive, but it looks like it’s back. On the first day of the diesel car ban in Delhi, both Uber and Ola have resumed surge prices to the capital. Chief Minister Arvind Kejriwal is not pleased. “Some taxis hv started charging surge. Surge not allowed under law. They r warned that strong action will be taken against them,” he tweeted. 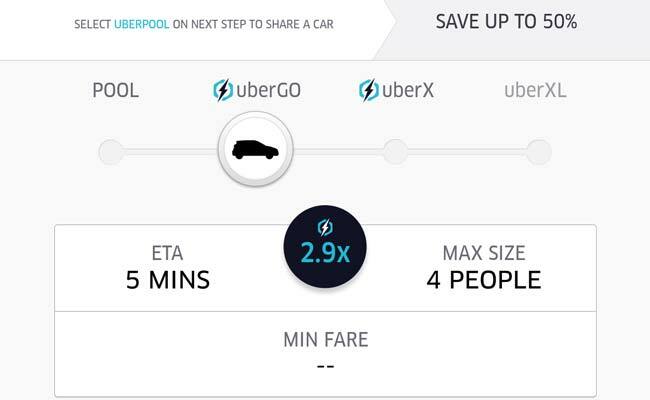 An Uber spokesperson confirmed the development, saying that the suspension of surge pricing was temporary. A senior Delhi government official said that action will be taken against these companies based on complaints. “We will impound their cabs,” the official said. The Delhi governement had earlier directed that cab aggregators in the city suspend surge pricing after the implementation of the odd-even rule that was designed to reduce pollution on Delhi’s streets. The move met with mixed reactions from the public. While people had maintained that surge pricing was exploitative and the ban was fair, others were of the opinion that private entities should be allowed to set their own prices. Immediately following the suspension, commuters had complained of fewer cabs being available. The Delhi government, unlike that in Karnataka, had appeared serious about implementing its ban. On the day following the directive, 18 cabs had been impounded by authorities for overcharging commuters.